Can you believe that 2016 is right around the corner? While I always have some excitement upon entering a new year, there is some anxiety that comes with that. Will 2016 be the year where I live my best life? If I had to focus on one thing and one thing only in the new year to reach my fullest potential overall I will have to say health. Yes, there are so many things I could choose to focus on in 2016 from getting rich to traveling more, but with every goal, I think health plays a role. Why the interest in living LIFE. TO THE FULLEST. 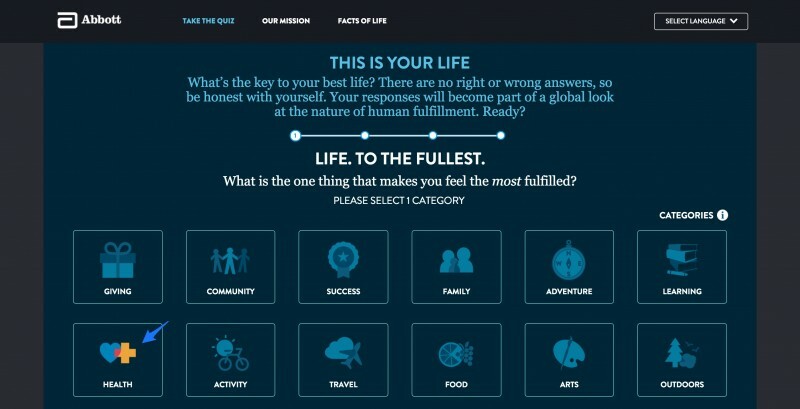 I took a quiz on the lifetothefullest.Abbott hub and it made me realize what I want to prioritize most in regards living my own LIFE. TO THE FULLEST. The lifetothefullest.abbott hub also includes great videos, articles, and fun facts. Their mission is to find out what living fully means to you and people all over the world. Everyone has their unique idea about how this looks and feels. But something that we all we each want to live the best life we can. ● Belief that good health (in fact, the best health possible) is essential to achieving your goals. ● Constantly looking for ways to maximize your life, the lives of those around you, and the broader community. ● Thrive: Be extraordinary in all that you do! ● Know: Stay one step ahead for total well-being! ● Manage: Accept no limits to your potential! I love this concept! And in the spirit of helping and learning more about myself I want to share my quiz results. When I took the Abbott quiz, my choice was health because I feel that to be successful in anything else, you have to be healthy first. It is hard to accomplish anything if you are sick in a hospital bed, so it’s best to take care of your health first. If you want to give back to your community by volunteering, it is hard to get up the energy to go if you are not feeling well. And when you are too tired from not getting enough sleep the night before, it is hard to get through a day at work without feeling like you need a nap. Long story short, you accomplish more for yourself and others when you feel good. And sure you can muster up the energy to get stuff done when you are not well, but it’s hard! Life is so much easier when you feel well. So for the sake of your success, take care of yourself! So when I describe health, there is so much more than just exercise and eating well. Here are a few of my items I plan to do in 2016 to better take care of my health. Exercise 2-3 times a week-Because I have my best days when I exercise. Get 8 hours of sleep most nights- because when I am well-rested, I achieve so much more in a day. Moisturize my skin daily-It is easy to neglect now because my skin is still pretty soft since I am still youthful, but I know if I keep skipping on lotion, my skin will not be so nice as I age. Relax at least once a week– High blood pressure runs in my family, and I do NOT want to have a heart attack at an early age. I will make a point to take it easy at least once a week. Cut out more junk from my diet-I started cutting the bad food this year, and I will continue in 2016. I know that cutting the crap will not only help me shed pounds but improve my mood. My #fullosophy for the new year is to feel good, and by feeling good, I will do even better. I have many goal ideas for the new year, but I know that first and foremost I have to feel good to achieve them. Check out the quiz at Abbott.